The challenge was to build an augmented reality app that communicates the science behind the Aurora Borealis in Abisko. A strong Aurora Borealis display over Abisko National Park in February 2014. The hotel lobby in of the Tourist Station in Abisko. Tourists visiting Abisko during the winter months state seeing the Northern Lights as their main motivation for the trip. Photographs of this nature phenomenon line the walls of the national parks' tourist station. But there is little information available on location that explains the science behind Northern Lights. The aim of this project consists of building a fun, educational and engaging Northern Lights installation available to every hotel guest. How can augmented reality be used for educational purposes and how does this change storytelling? Can I use this course to get rid of the stigma that «engineers can't do graphic design»? The solution is an interactive installation that uses augmented reality to explain the solar wind to hotel guests in Abisko. Invisible Forces is an installation that makes the earths magnetic field visible. It is installed in the lobby of a hotel with a lot of tourists who come to see the northern lights. There are two lamps, one representing the sun and the other representing our earth. Tourists can follow the life of a solar particle starting from its birth in the sun to its colourful death in the auroral circle on earth. And it also allows them to replay significant space weather events and see how they effect earth. The solution also opens up the space to think about augmented products. For instance, the Abisko Tourist Centre could start thinking about selling the lamps to tourist. Or another way of looking at it could be that any kind of objects at home could be repurposed to act as explanatory tools. It all starts with the sun. 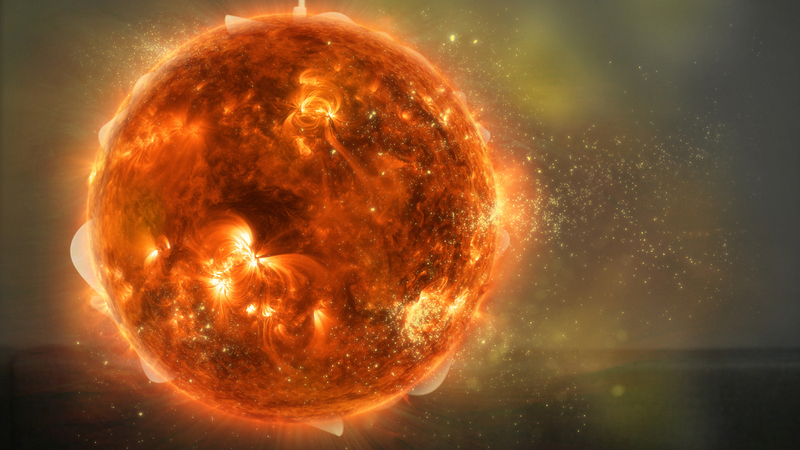 The sun is a huge ball of plasma with non-stop explosions on its surface. There are thousands of magnetic fields that twist, tear and move on the surface of the sun. These cause enormous solar flares in which the sun shoots out its particles into space. We call these particles the solar wind. The solar wind travels through the universe at hypersonic speeds. It takes these clouds of particles about a day or two to reach the earth. But the earth has a protective shield around it. We call it the magnetic field. It protects us from the deadly ultraviolet radiation of the sun. This shield deflects most of the solar wind and sends it back into space. But at the magnetic poles of our planet this shield is weaker, leaving the earth less protected. Some of the solar particles travel along the magnetic field lines and collide with the upper level of the earths atmosphere. When they hit the atmosphere is heated and excited. The excess energy of that collision gets away and the oxygen particles start to glow after they cool down. The glow can take on different colours. It all depends at what altitude this phenomena happens. Tourists can use the app to replay significant space weather events and see how they effect earth. More detailed information on the sunspot and strength of the Aurora Borealis. A friend back home receiving the recorded video on their iPad. The impact of the project is concept of how to make science cool again to a generation that checks their smartphone every 6 seconds. The communication opportunity was discovered during a five day trip to Abisko in February 2014. I got to experience Abisko for the first time through the eyes of a tourist and noticed that there was a distinct lack of scientific explanation of Auroras. Either it was assumed that all tourists already know about the solar wind or that they would look it up on the Internet. I also interviewed a couple of tourists and observed them in the hotel lobby spending a lot of time using their smartphones. Early concept sketches of the story "Life of a Solar Particle" using the hotel keycard as a means to map the projection in 3D space. 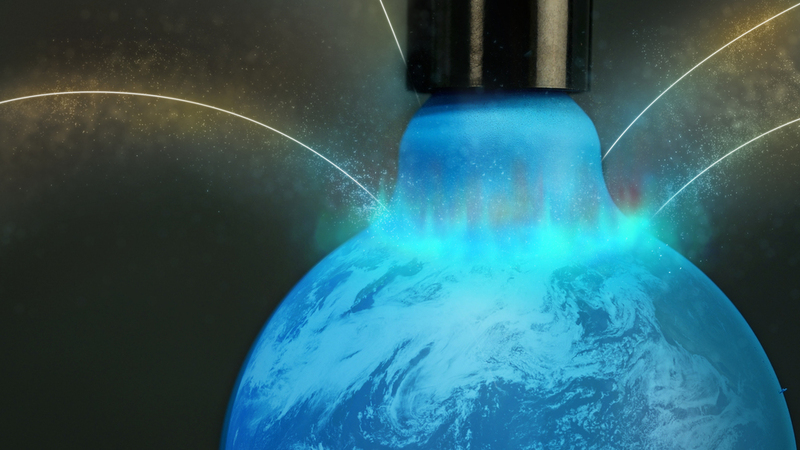 Using Autodesk Maya to build a 3D particle system that deflects when hitting the earth's magnetosphere. Unfortunately, there was not enough time to add these particles to the final video. Improving After Effects and Photoshop skills. Excursions to Autodesk Maya and its particle system. Shooting a video in an explanatory rather than narrative style. It takes a long time to narrow down a very open brief to the point where execution can start. Spend more time to integrate the system better into its environment. Work out the details of how the "call to action" works.